Today we have the most glorious day – the sun is shining and although it is still too cold and wet for serious gardening, it is certainly just right for a good walk – so long as one wraps up well! Lack of wind makes all the difference to the overall feel of a day like this – but it is not at all good for drying the washing! The things I hung out under the shelter yesterday are as wet as when I put them out – if not even wetter. It seems to happen always that we have the exact opposite weather to the south-east of England where our son, Robert, stays in Cambridge. I suppose I shouldn’t be surprised as it is diametrically opposite to us – far north-west to far south-east – but it also means that they get a lot less rain than we do, and not infrequently nowadays suffer drought conditions – although it is normally a lot warmer!! However, I simply cannot spend the whole day indoors on a day like this and when I have finished writing this post, I shall pop on my warm duffle coat, gloves and scarf and get out of the house for a bit – soaking up some Vitamin D while the going is good! I shall turn left at the bottom of our drive and head over towards Badnaban and Inverkirkaig. First of all, I have to get out of Strathan – which is the township to which we belong. When he first came to visit us here, Robert declared that Strathan was like a pudding basin and we lived halfway up one side of it. Well that is probably a fairly accurate description – but it isn’t all of Strathan. In the “pudding basin” we have us, our neighbours the Mathiesons in the bottom of it, where there are still the remains of the runrig system of cultivation to be clearly seen. This area is fenced off, and Donald Strathan – who owns the sheep who graze the Common Grazings around here – over-winters his ewes who are expecting twins in the bottom of the strath. Almost opposite us on the other side of the basin is a holiday home which for years belonged to one Billy Graham, but now seems to be an annex of a hotel on the Isle of Raasay, just off Skye. Going round and down from that house is where the Lasts used to live – Jaquie Last being our hairdresser. They have recently moved to their croft in Inverkerkaig, but their chickens are still in residence and although the house is for sale, they will in between times let it for holidays. Completing the circle on this side of the road, you come to the bottom of our drive which is shared with our close neighbours, Pearl and Kenny-John who built this house, and their son, Young Kenny, and his wife and two daughters – all of whom I seem to think I have mentioned before. Across the road from them is the old school house, which is now lived in by the Campbells and higher up the hill on the other side of the pudding basin is the home of Alistair and Wilma MacAskill who used to own the butcher’s shop. So that is our little community here in the “pudding basin”. When we first moved here, I worried about having so many neighbours so close by – our neighbours in Lincolnshire had four legs and curly tails, and the nearest house was ¼ mile away, but I need not have worried. As neighbours, we are all there for each other in times of crisis, we all get on very well together, but we do not live in each other’s pockets – which is as it should be. I am very happy to have such neighbours. However, as we take to the road – on foot this time – and go past the Campbells wonderful garden, and then on past the MacAskills high on the hillside, the road takes you through the gap in the hills – which gives us wonderful sunsets at certain times of the year, but also funnels the wind and rain up the road! On the left-hand side as you walk down the hill is another strathan – or small valley – and again it is sort of rounded in shape, but more like a salad bowl than a pudding basin. 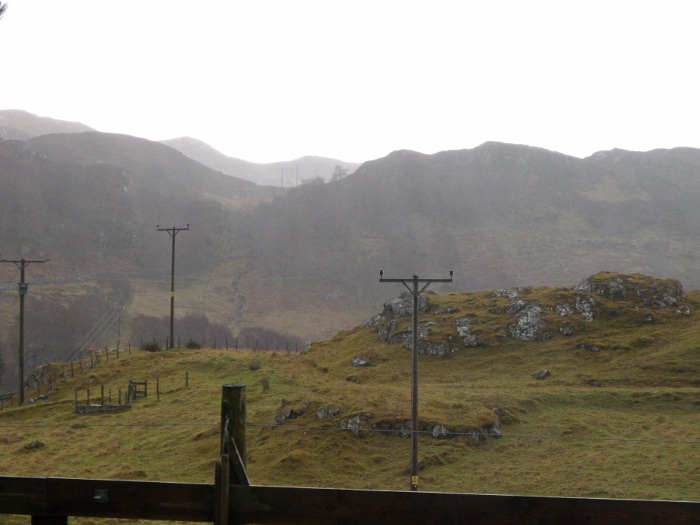 This time, although there are fences around the bottom, there is no sign of runrig cultivation – these were obviously just in-bye grazings for the crofts, and our local herd of deer are often to be seen grazing there. There is a single-storey, white painted house on the other side of this valley and also a creamy coloured two storey house which belongs to the Scots. 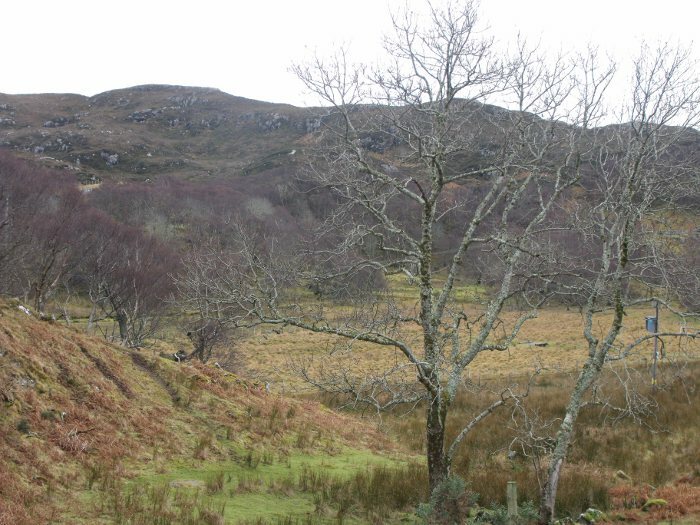 On the right-hand side is “Tigh nan Craobhan” or “House of the Trees”, which is again set back up the hill and as its name implies is fairly well surrounded by trees. I have always liked this house, but “Whincroft” further on down the road does nothing for me at all!! Walking further on down the hill you are still in Strathan, and you can see from this that it is rather straggled out along the road. Here we come to Donald Strathan – who is actually Donald MacLeod, but in the way of things in a place where there are lots of Donald MacLeods, he is known by the place from whence he comes. He and his family live in a sort of enclave of houses and barns which includes the house in which his late mother used to live. This little gathering of buildings is roughly opposite the white bungalow, and you have to appreciate that the road runs along what is basically a pass between the hills – Cnoc a’ Chlamhain or Hill of the Buzzard on the left and Cnoc Innis nan Each – Hill (of the) Place of the Horse – on the right. 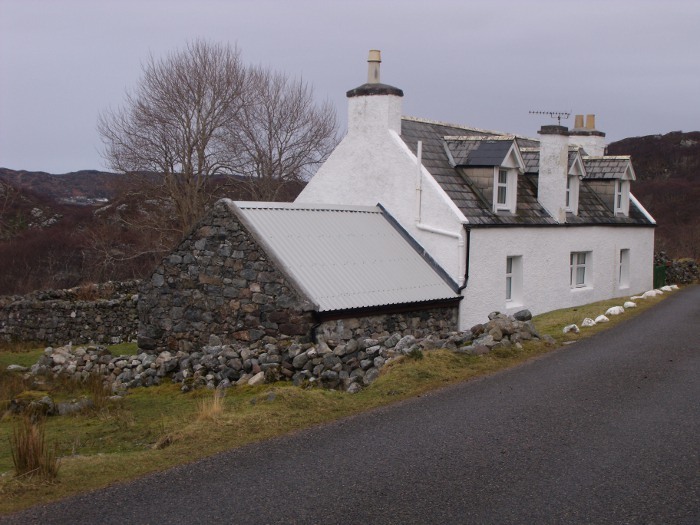 The old stone-built croft-house stands diagonally to the road and serves as a barn – it is always good to see the old stone structures put to good use even when they aren’t lived in any more. Up past the barn is the drive to “Whincroft” which is in very good order. The house itself is quite a big one by our standards and is set back in a wooded area where whin and rhododendron bushes abound. 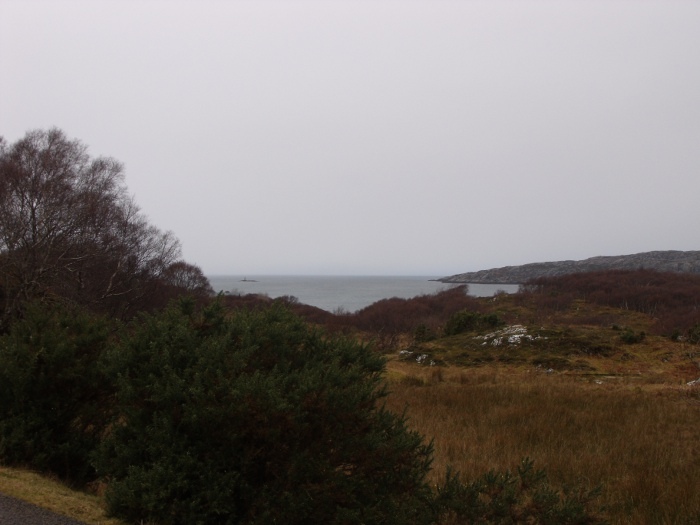 I have always felt that it is a rather gloomy house, and it is a private holiday home – like “Tigh nan Craobhan” – but recently I have noticed signs of great activity there, so maybe it will take on a new aspect – particularly if it gets a coat of paint!! “Whinroft” is almost exactly opposite the Scots’ house. Further on and at the bottom of the Scots’ steep drive, the road goes over a burn and is surrounded by big clumps of wild flag irises growing in the boggy ground – on a good iris year, it looks really spectacular just here with a carpet of yellow flowers. A few feet further on from the bridge, there is a right turn and immediately left through a gate and over a cattle grid that takes you down to “Lochinver Lodges and Cottage” – a group of five or six chalets, a couple of not very attractive but sizeable new houses and the original stone cottage which line the shore of a wee bay there, and are of course holiday lets owned by the largest of the property owners in the area. It is a not at all an unpleasant spot, although the beach is stony, with lovely views over the bay. The road itself goes on up now and after a bit of a breathless gradient – although it isn’t all that steep! – you come to “Strathcraig” which is the only house in the township which is right by the road – set down a bit so that you look down into the ground floor windows. Unfortunately, this too is a holiday let – the residents round here would love to see more of these houses filled with people actually living in them, however much we welcome the annual visitors to the area. This entry was posted in Local area and tagged local surroundings. Bookmark the permalink.